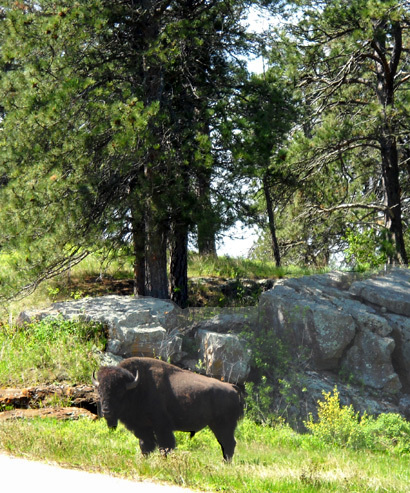 "There is much more to Wind Cave National Park than its underground geological wonders. when it became our seventh oldest national park." This was a busy day for us at Wind Cave. Since we have only one full day here, we decided to make the most of it and see as much as possible on foot and in the truck. After we got set up late yesterday afternoon we ate supper and went out for a walk through the campground. This morning we hiked separately on the Centennial Trail, then went back out for another loop together (for reasons I'll explain later). By then Jim's knee was hurting; he rested in the camper while I did one of the cave tours. 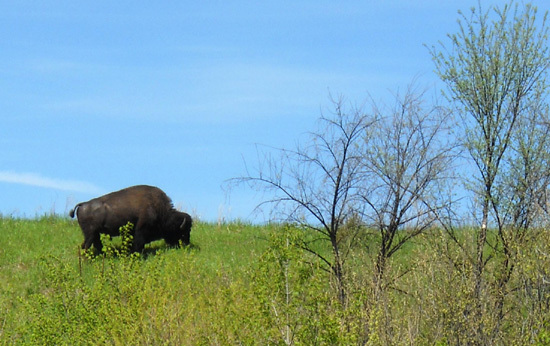 Bison have the run of the park; it's easy to spot them while driving or hiking. Busy, indeed. Because I want to do justice to each activity, I'll have three entries dated June 1. The trail entry will have two or three pages of photos because this is a beautiful park! This entry will focus on the campground and general park information. This is our first visit to Wind Cave and I'm guessing it won't be the last. We've enjoyed it, although we arrived about a week too early for some of the cave tours and for the ranger programs in the campground. Since Wind Cave isn't one of our better-known national parks I'm happy to promote it here. 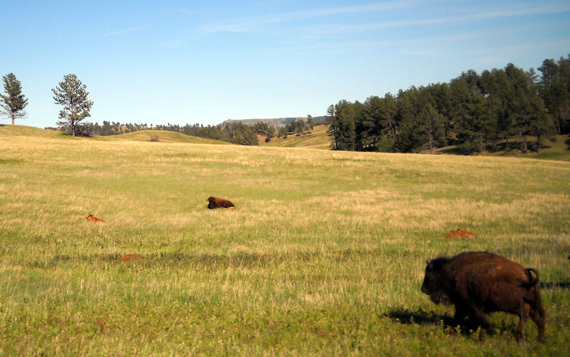 Here's one good reason to visit this park: Wind Cave is one of the few free national parks in the system, so if you're ever in the Black Hills you don't have an excuse not to go! The only things you have to pay for are camping, cave tours, and items in the gift shop or book store. The park is open 24/7 every day of the year, probably because US Highway 385 goes right through the middle of it. Elevations in the park range from 3,646 feet to 5,013 feet and since this is South Dakota, it does get below freezing and snows several months during the winter. 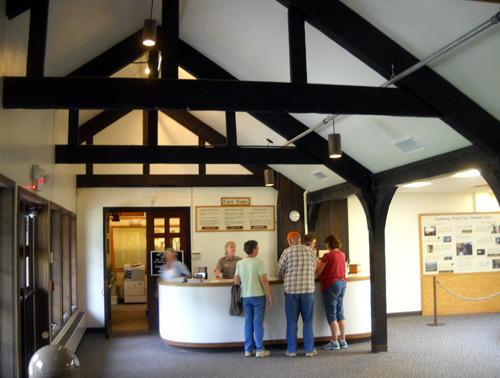 The visitor center is open -- and cave tours are offered -- every day except Thanksgiving, Christmas, and New Years Day; hours vary with the season. There are lots of interesting geological, historical, cultural, and environmental displays and videos in the visitor center and this is where folks assemble for the cave tours. Talks and nature walks are presented during the busier summer months, beginning June 11 this year. Note that services are pretty limited at Wind Cave. There are no restaurants, groceries, or lodging in the park. The only way to stay overnight is to camp. Limited vending facilities are located in the visitor center but you can't buy ice anywhere in the park -- or gas, diesel fuel, or propane. 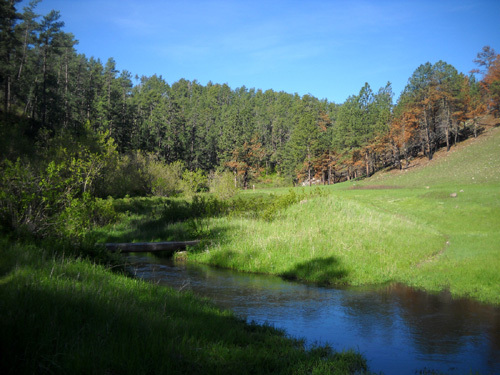 The closest town for any of those things is Hot Springs, 10-11 miles to the south, or farther north in Custer and Custer State Park. THANKS TO THE CCC . . . 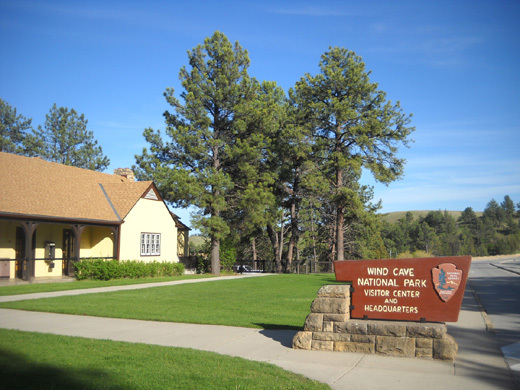 This is one of many state and national parks that the Civilian Conservation Corps helped build in the 1930s. 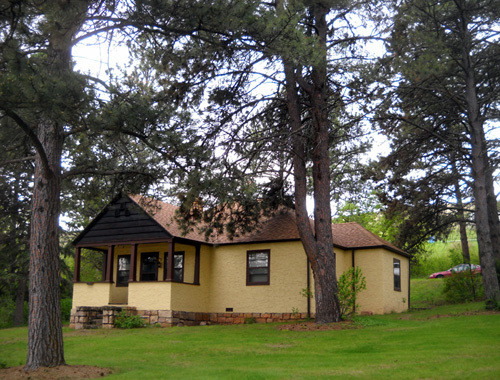 Although Wind Cave NP was established in 1903, most of the buildings, infrastructure, and work done to make the cave accessible to visitors was not feasible until the CCC came in. 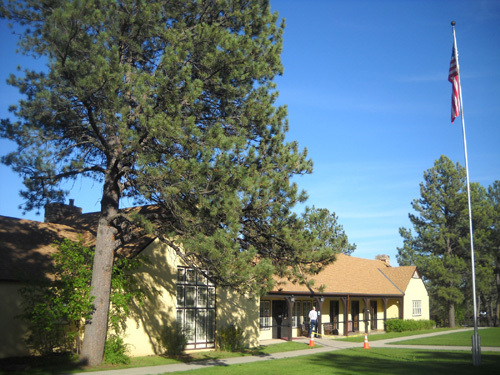 Over an eight-year period 200 young men at a time helped build the visitor center and several houses for park personnel. Among other things, they also constructed concrete stairs in the cave and a 212-foot elevator shaft, built trails, graded roads, planted trees, and served as fire lookouts. 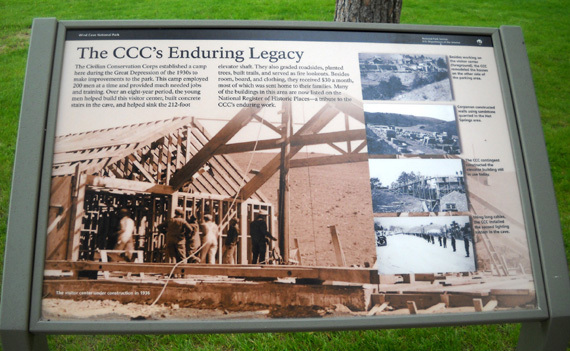 Most of the buildings in the park are listed on the National Register of Historic Places -- a tribute to the CCC's enduring work. YOU COULD GET LOST DOWN THERE . . . The main draw in the park is Wind Cave, which was regarded as sacred by Native Americans. Anglos found it when they settled in the area in the 19th Century. The cave was first explored by the Bingham brothers in 1881 after they heard a loud whistling noise. The sound led them to a small hole in the ground, the cave's only natural opening. That wind, which gave the cave its name, is created by differences between atmospheric pressures in the cave and outside. 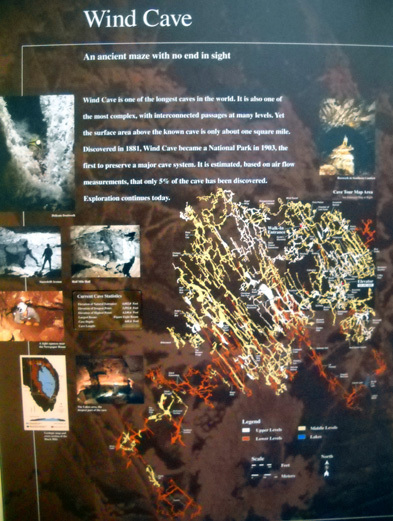 Later adventurers like Alvin McDonald explored the inside of the cave and discovered an extensive network of passageways containing boxwork, popcorn, and frostwork formations and other delicate features unique to caves in this region. I'll show photos of some of the formations in a subsequent entry. "An ancient maze with no end in sight"
About 135 miles of passageways have been surveyed in Wind Cave, making it the fourth longest in the world. After more than 100 years of exploration barometric wind studies estimate that only 5% of the total cave has been discovered so far. Wow. It's amazing that there are still such unexplored places in this country. Twenty-nine cave tours per day are offered in the summer, beginning this year on June 11. Today eleven tours were scheduled but on only two of the five routes that are offered during the summer season. I took the Natural Entrance Tour this afternoon and will write about it in another entry. Above ground, about 70% of the park's 28,295 acres is prairie and 30% is pine and hardwood forest. The terrain is hilly, dotted with cliffs and ravines, creeks and ponds. We saw bison, pronghorn antelope, mule deer, prairie dogs, and birds all the way from the southern end of the park to the visitor center and campground when we arrived yesterday. Just keep your eyes open -- and don't hit any critters when they're crossing the road! (one is lying down) and four babies lying in the grass. 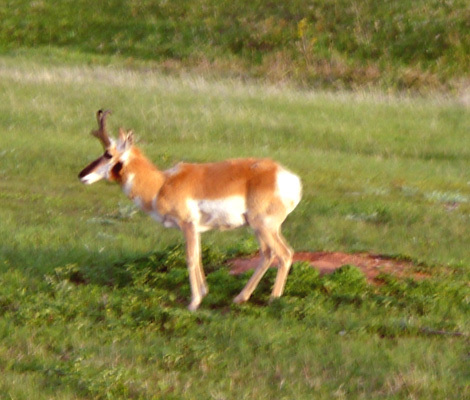 Visitors can tour the park in motor vehicles on several roadways, or they may explore on foot, bike, or horseback. 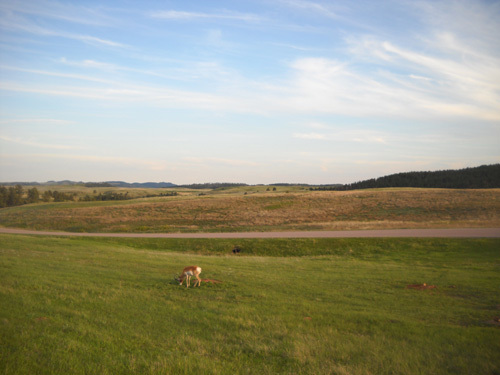 Two scenic paved roads (US 385 and SD 87) wind through the park, as well as two dirt roads (CR 5 and 6). Route 87 has some tight turns that might be difficult for larger RVs to negotiate but I've seen Class A motorhomes on the southern part of it (we haven't driven all of that road). 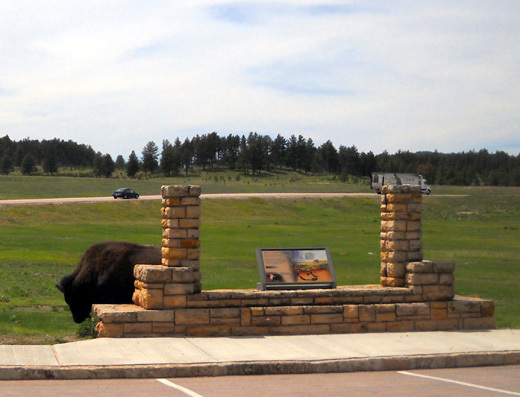 Route 87 extends into Custer State Park on the northern boundary of Wind Cave. Rangers assure us that US 385 is fine for big rigs. We plan to leave the park on it tomorrow when we drive up to Rapid City. on my hike I saw bison hair on several of the trail posts. 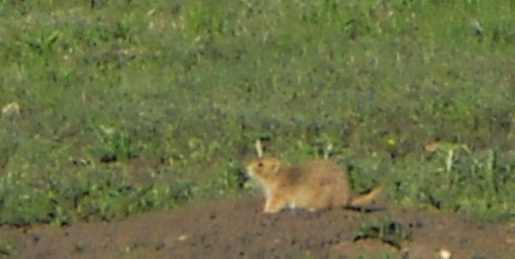 I zoomed in on this prairie dog about 100 feet away (another time when the buffalo wasn't there). 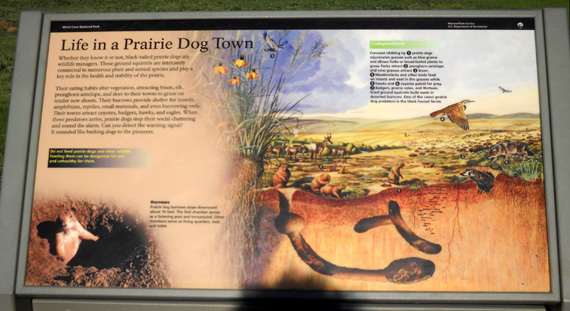 There are lots of scenic overlooks with interpretive exhibits, including one next to a prairie dog town (photos above), and several places within the park to pull off and enjoy a picnic if you're just driving through. If you have more time, check out the trails that meander throughout the park. 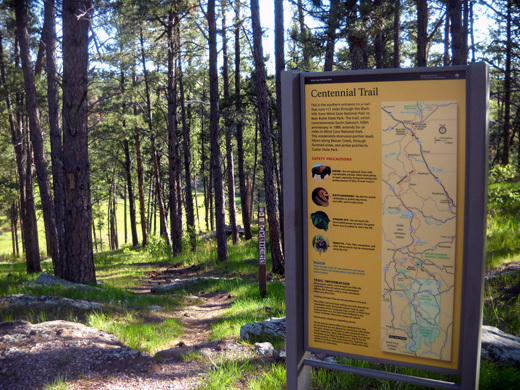 There are about 30 miles of single-track trails for foot traffic in Wind Cave NP, including the southernmost portion of the 111-mile Centennial Trail. We explored part of the trail network today and I'll be covering that in the next entry. 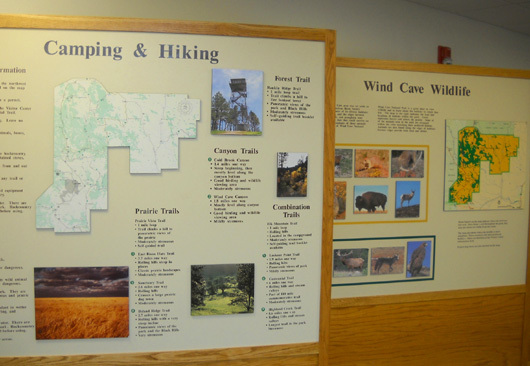 You can pick up good trail maps at the visitor center. The park newspaper, Passages, has a map in it of all the trails and descriptions/distances of each. Mountain bikes are not allowed on any of the trails; cyclists must stay on roadways but you can still see a lot of the park that way and get a good workout in the hilly terrain, too. 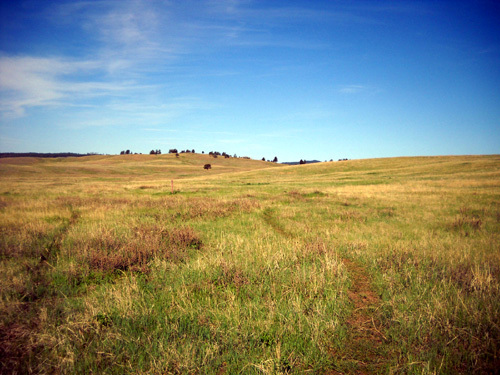 Equestrians may ride cross-country through the extensive prairie land and forests but not on footpaths. or ride a horse through much of the park going cross-country. In fact, the park's newspaper even encourages hikers to leave the trails and explore the canyons and prairies. Rangers do recommend carrying a topo map before setting out cross-country, however. To get a better feel for the park, stay one or more nights in the campground or back-pack to a remote campsite on one of the trails. 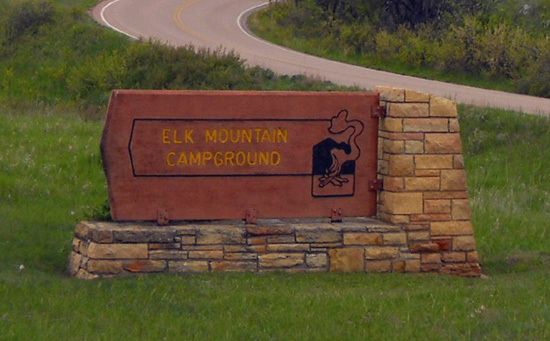 Elk Mountain Campground is open all year but flush toilets and water are available only from April through October. There are no electrical or water hookups at the sites, no showers, and no dump station. 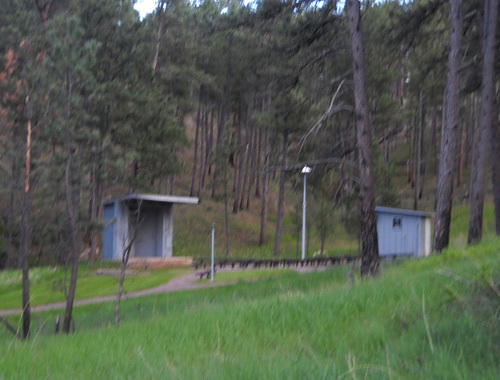 Campers can get water at several spigots in the campground. The campground fee is $12/night per site when water and toilet facilities are available; when the water is turned off, sites cost $6/night. The fees apply to everything from tents to motorhomes. Visitors holding certain passes, such as the National Parks senior passes we have, pay half price. Occupancy is on a first-come, first-served basis. That's why we didn't know if we'd get a site. We called, but the rangers couldn't tell us if the campground would be full when we got here late yesterday afternoon. Compounding the problem for us is that the majority of the sites are currently closed for paving and other improvements before the park gets busy in another week or two. Only one of four loops is open currently (B-loop) and just eleven of its twenty sites are open right now. Most of those were full. Thankfully no one was in the only site large enough for our rig, a pull-through next to the road and against a grassy hill. This site is perfect for us for two nights. We do not have any TV reception with just our Cameo antenna. Our Verizon phone signal is weak. Jim has gotten online a couple times with our MiFi card but it was spotty. There is no WiFi at the visitor center. When all the loops are open there are a total of 75 RV and tent sites; two group sites are available. 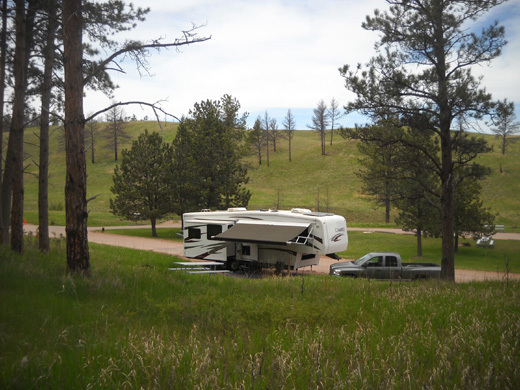 Two sites are reserved for campers with a handicapped license or disabled permit. 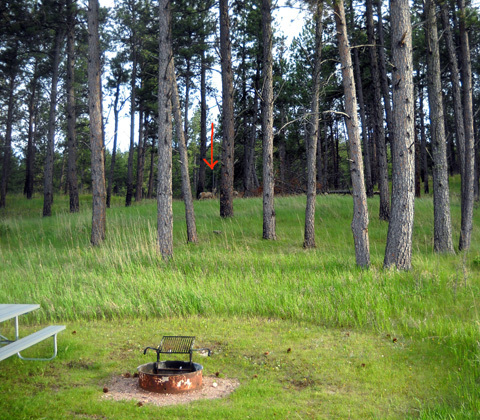 There is a 14-day limit of occupancy in the campground. I don't know if that can be extended off-season. Quiet hours are between 10 PM and 6 AM. Generator use is restricted to between 8 AM and 8 PM. During the summer months park rangers present nightly campfire programs at the amphitheater in the campground. Those aren't available for another week or two. 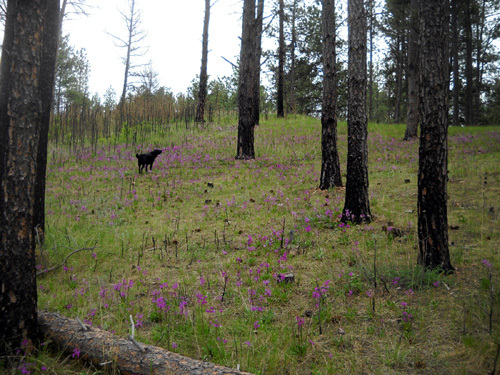 Elk Mountain Nature Trail, which is about a mile long, circles half of the campground and is one of only two trails in the park where leashed pets are allowed to hike. The other one is Prairie Vista Nature Trail near the visitor center picnic area. 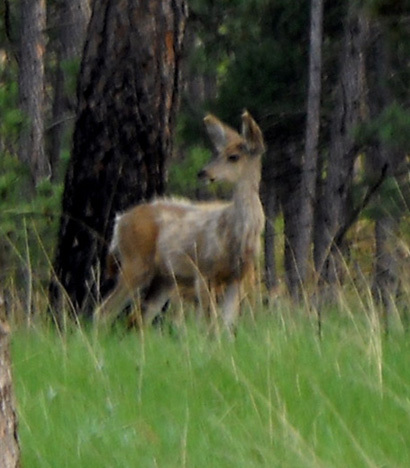 Because of all the bison, elk, pronghorn, coyotes, and other wildlife in the park, no pets are allowed on any of the other trails. 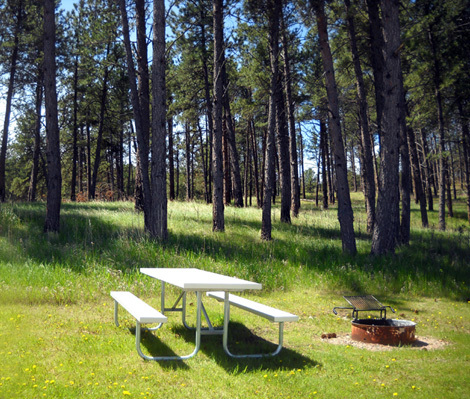 A permit is required for backcountry camping, which is limited to the northwestern part of the park off the Centennial, Rankin Ridge, and Sanctuary Trails. Several habitats and a variety of plants and animals can be found in this area. Permits are free and can be obtained at the visitor center. Pets are not permitted in the backcountry. Enjoy the wildlife instead! The Centennial Trail follows Beaver Creek through one of the valleys. Summer weather can be unpredictable in the Black Hills, with thunderstorms sometimes producing large hail, severe lightning, and prodigious amounts of rain. The steep canyons, rock cliffs, and small creeks in the park are prone to flash flooding, so be careful -- don't camp near a creek bed, even if it's dry when you get there. That's pretty good advice anywhere you put a tent or RV!